Born For Geekdom: Interview with Werner Weiss of "Yesterland"
A couple years ago, I went on the hunt for details of an extinct Disney attraction, the "Monster Sound Show" starring Chevy Chase and Martin Short. This hunt ended up as fuel for my first Orlando Attractions Column, "Retro Orlando". I discovered there were more freaks for details and trivia like me. On my search, I stumbled upon Yesterland, a website devoted to shows and attractions that no longer exist in the Disney theme parks. Before this, I thought the only truly immersive websites for Disney fans were Doombuggies and TellNoTales. I was lucky to correspond a bit with site creator and curator Werner Weiss, just one Disney geek to another. 1.) When did you start Yesterland? I began work on Yesterland in late 1994 as an effort to learn more about the Internet. The grand opening of Yesterland was May 20, 1995. 2.) When you started the site, were there a lot of similar sites? I'm noticing them springing up all over the place the last couple of years especially. There were already a few other sites about Disneyland and Walt Disney World, but not like today. There wasn't even an official Disneyland or Walt Disney World website, although Disney already had an official site promoting their movies. 3.) In your opinion, what is it about Disney culture, and the rides in particular, that inspires such a big fan community on the internet? There's a big Disney fan community because a lot of people enjoy the works of Walt Disney and the creative organization that he built. Although Walt and most of the people who worked with him have left us, new generations of Disney Imagineers, filmmakers, and other creative people have continued in the tradition of Walt Disney. 4.) What are some of your favorite Disney-related websites? MiceAge ( http://miceage.micechat.com/ ) and MiceChat ( http://www.micechat.com/ ) are favorites of mine. I check them daily. Since October 2006, Yesterland has been affiliated with them. We announce new Yesterland content at MiceAge. Readers can discuss the articles and other Disney park history topics on the Yesterland forums at MiceChat. Deb Wills has a great trip planning site at AllEarsNet ( http://allears.net/ ). I like to keep up with Disney Vacation Club is doing at DVCNews.com ( http://dvcnews.com/ ). Daveland ( http://davelandweb.com/disneyland/ ) has an amazing collection of vintage Disneyland photographs. There are a whole bunch of terrific blogs, websites, and discussion forums, all dealing with Disney in one way of another. There are too many to check them all every day. One of the reason I maintain a page of Disney Park History Links ( http://www.yesterland.com/links.html ) is for my own use. 5.) What is your favorite cancelled attraction at any of the parks? Mine is "Monster Sound Show". I miss the the Mine Train Through Nature's Wonderland at Disneyland. It was replaced by Big Thunder Mountain Railroad. The old ride was in the tradition of the Jungle Cruise, an open air scenic ride with show scenes that put you in another place. There was something new around every turn. Big Thunder is much more popular than the old Mine Train, and it's a very good ride. Still, I wish I could have taken my kids on the old Mine Train. 6.) What do you hope to see in the future of Yesterland? 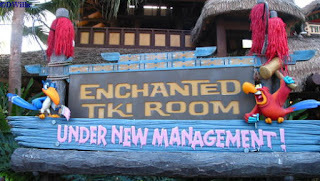 The current Enchanted Tiki Room Under New Management, which has been running at Magic Kingdom Park in Florida since 1998, needs to be retired. The New Management show has a cynical tone and unnecessary Disney characters who detract from the show. I'd like to see that show replaced with one that brings back the joy and friendly humor of the original Tiki Room. 7.) Are you a big fan of history in general, or is it just limited to the history of Disney theme parks? I like history. But I have to admit that I prefer historic sites and good history museums to reading a history book. Colonial Williamsburg is phenomenal. I spent a full week there last year with my wife any teenage daughters. We took in all the tours, street performances, and shows we could. It was a lot of fun and we learned a lot. It was a chance to experience how the historic events meshed with how people lived. 8.) Have there been any changes in the parks that you think have been negative as you've been keeping track of things through Yesterland over the years? I think there's now too much reliance on Disney and Pixar characters. In the past, characters were used sparingly and primarily just in Fantasyland. Now it seems that almost every new attraction and show has to be based on characters, regardless of the park or the section of the park. If the current philosophy had been in effect in the 1960s, great attractions like Pirates of the Caribbean and Haunted Mansion would never have been approved. 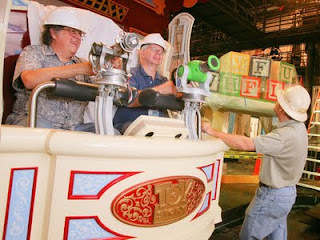 Imagineers working on one of many new movie-centric rides at WDW, this one is "Toy Story Mania". Original photo appeared in the Orlando Sentinel. 9.) How often do you get to a Disney theme park? I'm a frequent visitor to Walt Disney World. I go there at least once a year, usually for several weeks. I seldom go to Disneyland, usually just a couple of days every two or three years. From reading Yesterland, you'd think it was the other way around. 10.) What kind of people do you think like to visit your website? I get young readers who want to know what was around at Disneyland before they were. And I get readers who have fond memories of the 1950s, 1960s, 1970s, and so on. Some readers are die-hard Disney fans, while others just stumble on Yesterland while doing Google searches for an upcoming vacation. My website statistics show that so far, this year, Yesterland has had visitors from 190 countries, but primarily from the United States, United Kingdom, and Canada. 11.) What do you hope people take away from looking at "Yesterland"? I just hope they enjoy the pictures and the words. There you have it, another fun site for all you Disney buffs out there. I highly recommend a visit, especially if you're trying to recall something about the parks that was different long ago. Many thanks to Werner for allowing me to pick his brain. I find that one of the great ice-breakers or equalizers when interviewing somebody is to ask them about movies or Disney Theme Parks. Anytime I'm lucky enough to speak with another Disney enthusiast, like Jeff Baham, Cory Doctorow, Corey Burton or Kat Cressida, it's incredibly refreshing to instantly know you'll have a lot to talk about. People who are drawn to Disney parks seem to end up in creative professions. 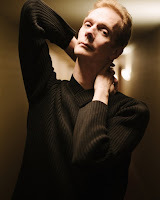 Even when I interviewed actor Doug Jones, one of my first questions was, "What's your favorite ride at Disneyland?" For the record, it was Space Mountain. He liked how immersive it was as a ride, with lights and music.